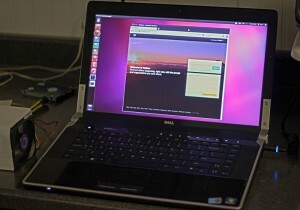 One of our Laptops, a Dell Studio XPS, running Ubuntu. Today we’re spending some time testing Social Media cross-platform. Facebook, Twitter, and Google spend a lot of time working to make sure that their platforms work on different operating systems, devices, browsers, screen-sizes, and connection speeds. It is also important for business owners to be aware of these factors, both with their websites and social media updates. When delivering a message with a call to action, try and limit any “roadblocks” that would keep interested and engaged users from completing your “conversion” – whether it be signing up for an newsletter, visiting your site, or buying a product. Some “roadblocks” might be things like requiring a user to sign-in or fill out long forms, sending a user to a page that isn’t optimized for mobile devices, or when the call-to-action page is slow to load because of large images or normal sized images without a content distribution network. At Get On Social we’re cognizant of all of these factors and can help you optimize your messages and increase your ROI and conversions.